Although this summer makes us all happy for longer than expected, the first great autumn trends are already online. While I do not like the winter, I’m always looking forward to the autumnal transition. Then it’s time again for layering, boots and trench coat! 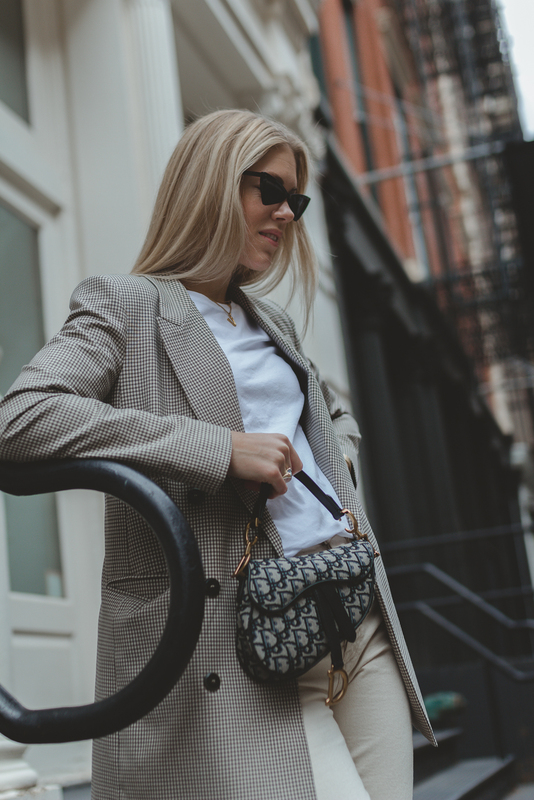 Although my look from New York is not too autumnal yet, I have already combined some autumn trends, including probably the most hyped bag of the year! 1. Plaid! To be honest, my look is more 2017 (shocking moment!) Checked pattern will be in trend again, but in 2018 we are going to style it in bright colors. But since I prefer wearing darker colors and only occasionally add more color, I wear my favorite checked blazer again. What I personally love about the check pattern? It can be just so great and easy combined and also fits great with other patterns. 2. The must-have among autumn trends: animal Print! Whether leopard, snake or tiger pattern – we are going wild this season! And I have to say, I’ve seriously rediscovered the leo pattern for me and I’ll show you an autumn look soon! On the other hand, I did not trust animal print pattern until I found the perfect snake printed heels in New York. They make the difference in every outfit! Again, I have linked all sorts of favorites! 3. When it comes to bags, a winner was pretty clear: the Dior saddle bag was really everywhere, the vintage sale was booming, and according to my Instagram, at some point I could say: tell me the blogger and I’ll tell you which saddle bag :D. Aaaa but I am here absolutely a trend victim and love my new baby! Of course there are other bag trends in fall 2018: bucket bags, round bags and party bags for example! I’ve put together some great models for you! Previous Post NEW YORK – no pants, no worries! The shirtdress to invest in! Next Post How to turn your evening dress into a everyday look? Ich hatte es dir ja schon auf Instagram geschrieben: Ich liebe diesen Look an dir! Die Farb-Palette ist sooo schön.